Hi ! We are Jarek and Angela. We came from creative background. Jarek is an architect. Creative process is our every day routine. The concept behind A MAN OF FEW WORDS is to create items that are our interpretation of classics, therefore to create new looks that stay classy. A man of few words is a person who speaks concisely. Few words but with a lot of sense. That is exactly our attitude. We expand this idiom as this is not only a matter of speaking but whole way of life. We use only natural and high quality materials. All items are made locally – in Poland, by small manufacturers. Sketching, choosing materials, patterns, colors, techniques, testing, experiencing… thats what we do. Since ages we value quality more than quantity when making purchases anything. So, when it turned out that the biggest problem for us was to get good quality, classic and simple items from shirt to clutch, so we decided that we will start doing it ourselves. And you know what? We loved it. It’s a big pleasure for us to look for the finest materials in small factories in Poland, so then with the group of our craftmans neatly cutting out the fabrics and finally sewing everything. We really like watch over all stages of creation, focusing on craftmanship and local producion which are deeply-rooted in our every product. We do our best to produce items that will live with you and make you happy for years. We get inspiration mainly from traveling which is our addiction now. Our first collection „Como Unspoken” is inspired by Lake Como in Italy. Inspirations also come from architecture, photography and cinema. When the creative juices are starting to flow and we keep them flowing as long as we can. Our items are available exclusively at www.amofw.com. 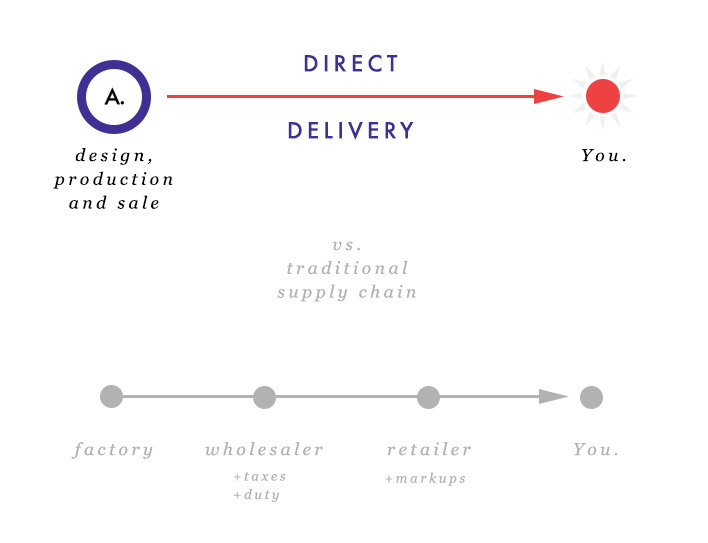 Delivery chain is simplified to minimum. The final price that you pay excludes taxes, duty, retailer markups and margins that are present in traditional supply chain which usually results in overpriced and poor quality products.